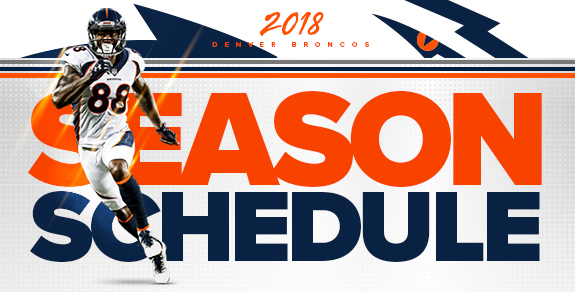 The Broncos’ 2018 schedule was released Thursday afternoon and lent clarity to the season’s outlook. The slate, which includes four games against 2017 playoff teams, kicks off with a home matchup with the Seattle Seahawks and concludes with a home game against the division-rival Los Angeles Chargers. The season opener will occur Sunday, Sept. 9 at 2:25 p.m. MDT as the Broncos kick off their 59th season. Denver last hosted Seattle in 2010, when the Broncos earned a 31-14 win. Denver will remain at home in Week 2 for their first divisional game, a Sept. 16 game against the Oakland Raiders. The Broncos split the series with the Raiders in 2017. After a road trip to Baltimore — whom the Broncos last faced in the 2015 season opener — the team will return home for a “Monday Night Football” contest against the reigning AFC West-champion Kansas City Chiefs. Denver has lost five straight against the Chiefs. The Broncos will follow that stretch of three of four games at home with three of their next four games on the road. On Oct. 7, Denver will travel to MetLife Stadium for a matchup with the Jets. The Broncos posted their first shutout win in more than a decade with a 23-0 win over the Jets last season. After a stop back at home for a date with the NFC West-champion Rams, the Broncos will visit the Arizona Cardinals on “Thursday Night Football.” Denver hasn’t played the Los Angeles Rams in a regular-season contest since 1994. The Broncos last competed against the Cardinals in 2014, when they earned a 41-20 home win. Denver then plays a mid-day game at Arrowhead Stadium against the Kansas City Chiefs on Oct. 28 and will host the Texans in Week 9 before a Week 10 bye. Following the bye, the Broncos then face another stretch with three of its four contests away from home. They’ll travel to the StubHub Center to play the Chargers in Week 11 before a home game against the Steelers in Week 12. Denver fell in its sole trip to the StubHub Center, but the team defeated the Chargers in last year’s season opener. The Broncos’ last game against Pittsburgh was a memorable 2015 playoff win en route to a Super Bowl 50 win. A Week 13 game against the Bengals and Week 14 contest against the 49ers will wrap up a two-game road stretch. The Broncos have not played a meaningful game in Levi’s Stadium since Super Bowl 50. The Broncos will finish their slate with two of their last three games at home, beginning with a visit from the Browns on Saturday, Dec. 15. Denver defeated the Browns in overtime during their last matchup. Denver then finishes its series with the Raiders on “Monday Night Football” on Christmas Eve, and a home game against the LA Chargers will conclude the Broncos’ regular-season slate. The dates and times for the Broncos’ four preseason matchups were also finalized. Denver will begin its preseason slate against the Vikings at Sports Authority Field at Mile High on Aug. 11 at 7:05 p.m. MT. In Week 2, the Broncos will host the Bears for two days of joint practices ahead of their game on Saturday, Aug. 18. Their third preseason game — largely referred to as a dress rehearsal for the regular season — will be played Friday, Aug. 24 at 7:30 p.m. ET at FedExField.